We encourage the development of rigorous, transparent methods of decision making, informed by patients' values, to improve health care decisions. 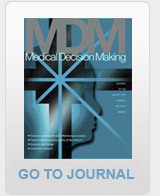 Medical Decision Making is an official journal of the Society for Medical Decision Making. MDM Policy & Practice is an open access journal focusing on the application of current theories, methods, and approaches. SMDM publishes four E-Newsletters per year, which are a primary communication vehicle for SMDM’s members. SMDM partnered with ISPOR on the Joint Modeling Good Research Practices Task Force to publish a series of articles available for review.